"The monks believe in a cycle of reincarnation, known as the Wheel Of Life." The Shaolin Monks of China have seen a lot of changes over recent years, but perhaps none as unusual as the move into the modern world. Slowly, they've learned that one way to keep their art alive and appreciated for years to come has been to interact more with the outside world, and especially tourists. The Shaolin realize that with the popularity of martial arts films and the upsurge in students of fighting arts, they must "cash in on it", so to speak, in order to insure their survival. There is even one student of Shaolin who has started his own school in the U.S., teaching the once "forbidden" art to everyday folks. Part of this modernization is the Shaolin: The Wheel 0f Life stage show, in which disciples of Shaolin perform an allegorical history of their order, as well as show off their considerable fighting skill. While at first I was uncomfortable with the idea of Shaolin Monks performing tricks for a paying audience, I suppose it's a sign of the times and a necessary evil in order to bring their message around the world.Using colorful lighting and carefully constructed, minimalist sets, Shaolin is a two-part, live performance. The first is the story of how the monks of Shaolin, once respected in China, were seen as enemies of the government, and eventually hunted down and killed, leaving only a handful of remaining disciples to hide and teach the art to another generation later down the road. The monks were devout Buddhists who used intense spiritual meditation as part of the developmentof defensive arts, during the very dangerous period of the Chinese Warlords. By summoning internal energies, the Shaolin were capable of breaking wood and stone, resisting massive blows and even sword penetrations. Although they were deadly combatants, it eventually became part of their religious life and was given much significance. For a very long time, the government was so afraid of spiritual martial arts, that it was illegal to practice them. While, obviously the history of these monks has been somewhat simplified, the artistic recreation here is quite stunning and well told.Of course, there's plenty of action; the monks perform staged, elaborate fights, as well as various stunts as part of the show. The end result is well choreographed and dazzling. Many of the spiritual messages of Shaolin Kung Fu and Buddhism are preserved, and the theme of the program will actually educate people as to the historical facts of this order. The important thing to remember about Wheel of Life is that it was only created out of participation and approval of the actual Shaolin Temple. This lends an impressive amount of legitimacy to the project. The monks seem to realize that they can use this modern medium to reach an audience with an ancient message. The second half of the program is dedicated exclusively to stunt-work. The monks showcase their various special fighting styles and abilities with specific weapons, along with their great strength. There is also an element of gymnastic prowess shown.The combination of faithful visuals, atmospheric soundtrack, and impressive on-stage action makes Shaolin admirable as well as entertaining. It brings back memoriesof the "golden age" of grand, historical, kung-fu epics coming out of Hong Kong that were both action-packed, but had meaning behind them as well. Now, we see the real people doing what they do best, and although I thought it might be exploitative, I was mostly proven wrong. An audience can certainly take a lot away from an intense performance such as this. Image Transfer Review: Shaolin appears to be designed for high-definition broadcast (especially with the1:78:1 aspect ratio), but the video quality doesn't quite reflect it, although the complaints are generally minor. There's a surprising amount of grain over the picture, often exaggerated whenever slow-motion photography is used, which is quite often. There's a fuzziness to the picture in many of these sequences, which softens the already diffused look of the film. While the colors and the balance between shaded areas is nicely contained, this fuzz causes a loss of detail in scenes filmed from farther way than the on-stage cameras. Slight digital movement and shimmer is seen throughout most of the film as well, mainly because of this smoky effect. Generally, none of these things cause many problems and don't distract. Audio Transfer Review: The only featured audio is a Dolby Digital 5.0 track, which is quite up to the task of bringing the stage show alive. The soundfield is very much like sitting in the audience,with the front speakers handling most of the musical score and occasional narration. Sound effects are usually musical in nature (things like cymbals and kettle drums), and there's little in the way of foley; it's all very stylish in that way. The rear channel stakes some of the auditorium-like ambience and is where the bulk of the audience reaction is, mostly applause. Despite the lack of a specific bass track, the low-end was handled well, mainly provided by all the drumming in the soundtrack. Extras Review: The biggest and most important feature is a 45-minute documentary about the development and making of the Wheel of Life project. I expected a fluffy promotional piece, but it's actually an 'A' class documentary in and of itself. The main crew and even actual Shaolin monks, as well as their head abbot, talk on camera about how the show began. As cameras were taken even on scouting trips to the Shaolin Temple outside of Beijing, the entire process is well recorded. Narration is provided by John Hurt, and the whole thing is very well produced and really a must-see accompaniment to the show itself. There is a gallery of still photos from the show, as well as a textual history of the Shaolin order. There's some DVD-ROM features (weblinks, it would appear). 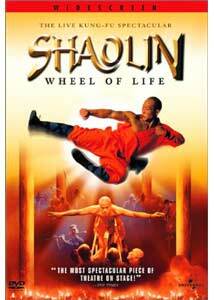 Wonderfully staged and, at times, breathtaking in its overall scope, Wheel of Life is a fantastic showcase of the unique talents of the Shaolin Monks. Definitely recommended.